This elegant Sephardi style Ketubah was created in celebration of the 18th Anniversary of the couple. 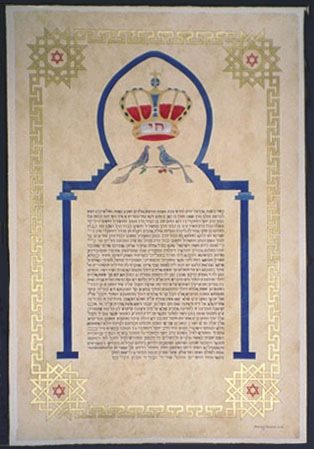 The Orthodox Sephardi text is written in blue on the "parchment" background . In the space withing Moroccan style gate are Torah Crown with the Chai in red letters, and the two Peacocks sitting on the Pomegranate branch symbolizing Abundance. The outer frame has four stars in the corners of the Ketubah with the four Star of David in them. paper: 140 lbs decorated by the artist. Ink: Watercolour, Gouache, dry pigments .